This article is about the stock market index with ticker DJIA. For the company that publishes it, see S&P Dow Jones Indices. The Dow Jones Industrial Average (DJIA), or simply the Dow (/ˈdaʊ/), is a stock market index that indicates the value of 30 large, publicly owned companies based in the United States, and how they have traded in the stock market during various periods of time. These 30 companies are also included in the S&P 500 Index. The value of the Dow is not a weighted arithmetic mean and does not represent its component companies' market capitalization, but rather the sum of the price of one share of stock for each component company. The sum is corrected by a factor which changes whenever one of the component stocks has a stock split or stock dividend, so as to generate a consistent value for the index. Historical logarithmic graph of the DJIA from 1896 to 2010. It is the second-oldest U.S. market index after the Dow Jones Transportation Average, created by Wall Street Journal editor and Dow Jones & Company co-founder Charles Dow. Currently owned by S&P Dow Jones Indices, which is majority owned by S&P Global, it is the best known of the Dow Averages, of which the first (non-industrial) was originally published on February 16, 1885. The averages are named after Dow and one of his business associates, statistician Edward Jones. The industrial average was first calculated on May 26, 1896. The Industrial portion of the name is largely historical, as many of the modern 30 components have little or nothing to do with traditional heavy industry. Since the divisor is currently less than one, the value of the index is larger than the sum of the component prices. 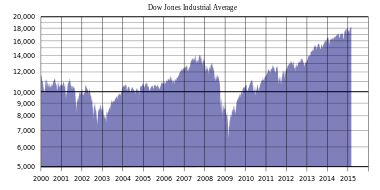 Although the Dow is compiled to gauge the performance of the industrial sector within the American economy, the index's performance continues to be influenced by not only corporate and economic reports, but also by domestic and foreign political events such as war and terrorism, as well as by natural disasters that could potentially lead to economic harm. On April 8, 2004, American International Group Incorporated, Pfizer Incorporated, and Verizon Communications Incorporated replaced AT&T Corporation, Eastman Kodak Company, and International Paper Company. On February 19, 2008, Chevron and Bank of America replaced Altria Group and Honeywell. Chevron was previously a Dow component from July 18, 1930, to November 1, 1999. During Chevron's absence, its split-adjusted price per share went from $44 to $85, while the price of petroleum rose from $24 to $100. On September 22, 2008, Kraft Foods Inc replaced the American International Group (AIG) in the index. On June 8, 2009, the Travelers Companies and Cisco Systems replaced General Motors Corporation and Citigroup. Cisco became the third company traded on the NASDAQ to be part of the Dow. On September 24, 2012, UnitedHealth Group replaced Kraft Foods Inc following Kraft's split into Mondelēz International and Kraft Foods Group. On March 19, 2015, Apple replaced AT&T, which had been a component of the DJIA since November 1916. Apple became the fourth company traded on the NASDAQ to be part of the Dow. On September 1, 2017, DowDuPont replaced DuPont. DowDuPont was formed by the merger of Dow Chemical Company with DuPont. On June 26, 2018, Walgreens Boots Alliance replaced General Electric, which had been a component of the DJIA since November 1907, after being part of the inaugural index in May 1896 and much of the 1886 to 1907 period. On April 2, 2019, Dow, Inc. replaced DowDuPont. Dow, Inc. is a spin-off of DowDuPont, itself a merger of Dow Chemical Company and DuPont. In 1884, Charles Dow composed his first stock average, which contained nine railroads and two industrial companies that appeared in the Customer's Afternoon Letter, a daily two-page financial news bulletin which was the precursor to The Wall Street Journal. On January 2, 1886, the number of stocks represented in what is now the Dow Jones Transportation Average dropped from 14 to 12, as the Central Pacific Railroad and Central Railroad of New Jersey were removed. Though comprising the same number of stocks, this index contained only one of the original twelve industrials that would eventually form Dow's most famous index. American Cotton Oil Company, a predecessor company to Bestfoods, now part of Unilever. American Sugar Company, became Domino Sugar in 1900, now Domino Foods, Inc.
American Tobacco Company, broken up in a 1911 antitrust action. Chicago Gas Company, bought by Peoples Gas Light in 1897, now an operating subsidiary of Integrys Energy Group. Distilling & Cattle Feeding Company, now Millennium Chemicals, formerly a division of LyondellBasell, the latter of which recently emerged from Chapter 11 bankruptcy. General Electric, still in operation, removed from the Dow Jones Industrial Average in 2018. Laclede Gas Company, still in operation as Spire Inc, removed from the Dow Jones Industrial Average in 1899. National Lead Company, now NL Industries, removed from the Dow Jones Industrial Average in 1916. North American Company, an electric utility holding company, broken up by the U.S. Securities and Exchange Commission (SEC) in 1946. Tennessee Coal, Iron and Railroad Company in Birmingham, Alabama, bought by U.S. Steel in 1907; U.S. Steel was removed from the Dow Jones Industrial Average in 1991. U.S. Leather Company, dissolved in 1952. United States Rubber Company, changed its name to Uniroyal in 1961, merged with private B.F. Goodrich in 1986, bought by Michelin in 1990. When it was first published in the mid-1880s, the index stood at a level of 62.76. It reached a peak of 78.38 during the summer of 1890, but ended up hitting its all-time low of 28.48 in the summer of 1896 during the Panic of 1896. Many of the biggest percentage price moves in the Dow occurred early in its history, as the nascent industrial economy matured. The 1900s would see the Dow halt its momentum as it worked its way through two financial crises; the Panic of 1901 and the Panic of 1907. The Dow would remain stuck in a range between 53 and 103 points until late 1914. The negativity surrounding the 1906 San Francisco earthquake did little to improve the economic climate. At the start of the 1910s, the decade would begin with the Panic of 1910–1911 stifling economic growth for a lengthy period of time. History would later take its course on July 30, 1914; as the average stood at a level of 71.42 when a decision was made to close down the New York Stock Exchange, and suspend trading for a span of four and a half months. Some historians believe the exchange closed because of a concern that markets would plunge as a result of panic over the onset of World War I. An alternative explanation is that the Secretary of the Treasury, William Gibbs McAdoo, closed the exchange to conserve the U.S. gold stock in order to launch the Federal Reserve System later that year, with enough gold to keep the United States on par with the gold standard. When the markets reopened on December 12, 1914, the index closed at 74.56, a gain of 4.4 percent. This is frequently reported as a large drop, due to using a later redefinition. Reports from the time say that the day was positive. Following World War I, the United States would experience another economic downturn, the post-World War I recession. The Dow's performance would remain unchanged from the closing value of the previous decade, adding only 8.26%, from 99.05 points at the beginning of 1910, to a level of 107.23 points at the end of 1919. During the 1920s, specifically In 1928, the components of the Dow were increased to 30 stocks near the economic height of that decade, which was nicknamed the Roaring Twenties. This period downplayed the influence of an early 1920s recession plus certain international conflicts such as the Polish-Soviet war, the Irish Civil War, the Turkish War of Independence and the initial phase of the Chinese Civil War. The Crash of 1929 and the ensuing Great Depression over the next several years returned the average to its starting point, almost 90% below its peak. By July 8, 1932, following its intra-day low of 40.56, the Dow would end up closing the session at 41.22. The high of 381.17 on September 3, 1929, would not be surpassed until 1954, in inflation-adjusted numbers. However, the bottom of the 1929 Crash came just 2​1⁄2 months later on November 13, 1929, when intra-day it was at the 195.35 level, closing slightly higher at 198.69. For the decade, the Dow would end off with a healthy 131.7% gain, from 107.23 points at the beginning of 1920, to a level of 248.48 points at the end of 1929, just before the Crash of 1929. Marked by global instability and the Great Depression, the 1930s contended with several consequential European and Asian outbreaks of war, leading up to catastrophic World War II in 1939. Other conflicts during the decade which affected the stock market included the 1936–1939 Spanish Civil War, the 1935–1936 Second Italo-Abyssinian War, the Soviet-Japanese Border War of 1939 and the Second Sino-Japanese War from 1937. On top of that, the United States dealt with a painful recession in 1937 and 1938 which temporarily brought economic recovery to a halt. The largest one-day percentage gain in the index, 15.34%, happened on March 15, 1933, in the depths of the 1930s bear market when the Dow gained 8.26 points to close at 62.10. However, as a whole throughout the Great Depression, the Dow posted some of its worst performances, for a negative return during most of the 1930s for new and old stock market investors. For the decade, the Dow Jones average was down from 248.48 points at the beginning of 1930, to a stable level of 150.24 points at the end of 1939, a loss of about 40%. 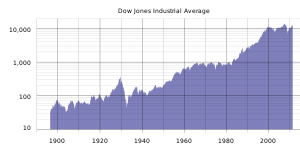 Post-war reconstruction during the 1940s, along with renewed optimism of peace and prosperity, brought about a 39% surge in the Dow from around the 148 level to 206. The strength in the Dow occurred despite a brief recession in 1949 and other global conflicts which started a short time later including the latter stages of the Chinese Civil War, the Greek Civil War, the Indo-Pakistani War of 1947 and the 1948 Arab–Israeli War. During the 1950s, the Korean War, the Algerian War, the Cold War and other political tensions such as the Cuban Revolution, as well as widespread political and economic changes in Africa during the initial stages of European Decolonization, did not stop the Dow's bullish climb higher. Additionally, the U.S. would also make its way through two grinding recessions; one in 1953 and another in 1958. A 200% increase in the average from a level of 206 to 616 ensued over the course of that decade. The Dow fell 22.61% on Black Monday (1987) from about the 2,500 level to around 1,750. Two days later, it rose 10.15% above the 2,000 level for a mild recovery attempt. The Dow's bullish behavior began to stall during the 1960s as the U.S. became entangled with foreign political issues such as U.S. military excursions including the Bay of Pigs Invasion involving Cuba, the Vietnam War, the Portuguese Colonial War, the Colombian civil war which the U.S. assisted with short-lived counter-guerrilla campaigns, as well as domestic issues such as the Civil Rights Movement and several influential political assassinations. For the decade though, and despite a mild recession between 1960 and 1961, the average still managed a respectable 30% gain from the 616 level to 800. The 1970s marked a time of economic uncertainty and troubled relations between the U.S. and certain Middle-Eastern countries. To begin with, the decade started off with the ongoing Recession of 1969–70. Following that, the 1970s energy crisis ensued which included the 1973–75 recession, the 1973 oil crisis as well as the 1979 energy crisis beginning as a prelude to a disastrous economic climate injected with stagflation; the combination between high unemployment and high inflation. However, on November 14, 1972, the average closed above the 1,000 mark (1,003.16) for the first time, during a brief relief rally in the midst of a lengthy bear market. 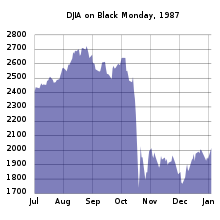 Between January 1973 and December 1974, the average lost 48% of its value in what became known as the 1973–1974 Stock Market Crash; with the situation being exacerbated by the events surrounding the Yom Kippur War. The index closed at 577.60, on December 4, 1974. During 1976, the index went above 1000 several times, and it closed the year at 1,004.75. Although the Vietnam War ended in 1975, new tensions arose towards Iran surrounding the Iranian Revolution in 1979. Other notable disturbances such as the Lebanese Civil War, the Ethiopian Civil War, the Indo-Pakistani War of 1971 and the Angolan Civil War which the U.S. and Soviet Union considered critical to the global balance of power, seemed to have had little influence towards the financial markets. Performance-wise for the decade, gains remained virtually flat, rising less than 5% from about the 800 level to 838. The 1980s decade started with the early 1980s recession. In early 1981, it broke above 1000 several times, but then retreated. The largest one-day percentage drop occurred on Black Monday; October 19, 1987, when the average fell 22.61%. There were no clear reasons given to explain the crash, but program trading may have been a major contributing factor. On October 13, 1989, the Dow stumbled into another downfall, the 1989 Mini-Crash which initiated the collapse of the junk bond market as the Dow registered a loss of almost 7%. For the decade, the Dow made a 228% increase from the 838 level to 2,753; despite the market crashes, Silver Thursday, an early 1980s recession, the 1980s oil glut, the Japanese asset price bubble and other political distractions such as the Soviet–Afghan War, the Falklands War, the Iran–Iraq War, the Second Sudanese Civil War and the First Intifada in the Middle East. The index had only two negative years, which were in 1981 and 1984. The 1990s brought on rapid advances in technology along with the introduction of the dot-com era. To start off, the markets contended with the 1990 oil price shock compounded with the effects of the Early 1990s recession and a brief European situation surrounding Black Wednesday. Certain influential foreign conflicts such as the 1991 Soviet coup d'état attempt which took place as part of the initial stages of the Dissolution of the USSR and the Fall of Communism; the First and Second Chechen Wars, the Persian Gulf War and the Yugoslav Wars failed to dampen economic enthusiasm surrounding the ongoing Information Age and the "irrational exuberance" (a phrase coined by Alan Greenspan) of the Internet Boom. Even the occurrences of the Rwandan Genocide and the Second Congo War, termed as "Africa's World War" that involved 8 separate African nations which together between the two killed over 5 million people, didn't seem to have any noticeable negative financial impact on the Dow either. Between late 1992 and early 1993, the Dow staggered through the 3,000 level making only modest gains as the Biotechnology sector suffered through the downfall of the Biotech Bubble; as many biotech companies saw their share prices rapidly rise to record levels and then subsequently fall to new all-time lows. On November 21, 1995, the DJIA closed above the 5,000 level (5,023.55) for the first time. Over the following two years, the Dow would rapidly tower above the 6,000 level during the month of October in 1996, and the 7,000 level in February 1997. On its march higher into record territory, the Dow easily made its way through the 8,000 level in July 1997. However, later in that year during October, the events surrounding the Asian Financial Crisis plunged the Dow into a 554-point loss to a close of 7,161.15; a retrenchment of 7.18% in what became known as the 1997 Mini-Crash. Although internationally there was negativity surrounding the 1998 Russian financial crisis along with the subsequent fallout from the 1998 collapse of the derivatives Long-Term Capital Management hedge fund involving bad bets placed on the movement of the Russian ruble, the Dow would go on to surpass the 9,000 level during the month of April in 1998, making its sentimental push towards the symbolic 10,000 level. On March 29, 1999, the average closed above the 10,000 mark (10,006.78) after flirting with it for two weeks. This prompted a celebration on the trading floor, complete with party hats. The scene at the exchange made front-page headlines on many U.S. newspapers such as The New York Times. On May 3, 1999, the Dow achieved its first close above the 11,000 mark (11,014.70). Total gains for the decade exceeded 315%; from the 2,753 level to 11,497. The Dow averaged a 5.3% return compounded annually for the 20th century, a record Warren Buffett called "a wonderful century"; when he calculated that to achieve that return again, the index would need to close at about 2,000,000 by December 2099. During the height of the dot-com era, authors James K. Glassman and Kevin A. Hassett went so far as to publish a book entitled Dow 36,000: The New Strategy for Profiting From the Coming Rise in the Stock Market. Their theory was to imply that stocks were still cheap and it was not too late to benefit from rising prices during the Internet boom. Characterized by fear on the part of newer investors, the uncertainty of the 2000s (decade) brought on a significant bear market. There was indecision on whether the cyclical bull market represented a prolonged temporary bounce or a new long-term trend. Ultimately, there was widespread resignation and disappointment as the lows were revisited, and in some cases, surpassed near the end of the decade. The Dow fell 14.3% from the mid-9,000 level to the low 8,000 level after the September 11, 2001 attacks. Exchanges were closed between September 11 and 17. The eighth largest one-day point drop in DJIA history, and largest at the time, occurred on September 17, 2001, the first day of trading after the September 11, 2001 attacks, when the Dow fell 684.81 points, or 7.1%. However, the Dow had been in a downward trend for virtually all of 2001 prior to September 11, losing well over 1000 points between January 2 and September 10, and had lost 187.51 points on September 6, followed by losing 235.4 points on September 7. By the end of that week, the Dow had fallen 1,369.70 points, or 14.3%. However, the Dow began an upward trend shortly after the attacks, and quickly regained all lost ground to close above the 10,000 level for the year. During 2002, the average remained subdued without making substantial gains due to the stock market downturn of 2002 as well as the lingering effects of the dot-com bubble. In 2003, the Dow held steady within the 7,000 to 9,000-point level range by the early 2000s recession, the Afghan War and the Iraq War. But by December of that year, the Dow remarkably returned to the 10,000 mark. In October 2006, four years after its bear market low, the DJIA set fresh record theoretical, intra-day, daily close, weekly, and monthly highs for the first time in almost seven years, closing above the 12,000 level for the first time on the 19th anniversary of Black Monday (1987). On February 27, 2007, the Dow Jones Industrial Average fell 3.3% (415.30 points), its biggest point drop since 2001. The initial drop was caused by a global sell-off after Chinese stocks experienced a mini-crash, yet by April 25, the Dow passed the 13,000 level in trading and closed above that milestone for the first time. On July 19, 2007, the average passed the 14,000 level, completing the fastest 1,000-point advance for the index since 1999. One week later, a 450-point intra-day loss, owing to turbulence in the U.S. sub-prime mortgage market and the soaring value of the yuan, initiated another correction falling below the 13,000 mark, about 10% from its highs. On October 9, 2007, the Dow Jones Industrial Average closed at a record high of 14,164.53. Two days later on October 11, the Dow traded at an intra-day level high of 14,198.10, a mark which would not be matched until March 2013. In what would normally take many years to accomplish; numerous reasons were cited for the Dow's extremely rapid rise from the 11,000 level in early 2006, to the 14,000 level in late 2007. They included future possible takeovers and mergers, healthy earnings reports particularly in the tech sector, and moderate inflationary numbers; fueling speculation the Federal Reserve would not raise interest rates. On September 15, 2008, a wider financial crisis became evident when Lehman Brothers filed for Chapter 11 bankruptcy along with the economic effect of record high oil prices which reached almost $150 per barrel two months earlier. When opening that morning, it immediately lost 300 points and overall the DJIA lost more than 500 points for only the sixth time in history, returning to its mid-July lows below the 11,000 level. A series of "bailout" packages, including the Emergency Economic Stabilization Act of 2008, proposed and implemented by the Federal Reserve and U.S. Treasury, as well as FDIC-sponsored bank mergers, did not prevent further losses. After nearly six months of extreme volatility during which the Dow experienced its largest one-day point loss, largest daily point gain, and largest intra-day range (more than 1,000 points), the index closed at a new twelve-year low of 6,547.05 on March 9, 2009 (after an intra-day low of 6,469.95 during the March 6 session), its lowest close since April 1997, and had lost 20% of its value in only six weeks. Towards the latter half of 2009, the average rallied towards the 10,000 level amid optimism that the Late-2000s (decade) Recession, the United States Housing Bubble and the Global Financial Crisis of 2008–2009, were easing and possibly coming to an end. For the decade, the Dow saw a rather substantial pullback for a negative return from the 11,497 level to 10,428, a loss of a little over 9%. The DJIA from January 2000 through February 2015. During the early part of the 2010s, aided somewhat by the loose monetary policy practiced by the Federal Reserve, the Dow made a notable rally attempt, though with significant volatility due to growing global concerns such as the 2010 European sovereign debt crisis, the Dubai debt crisis, and the United States debt ceiling crisis. 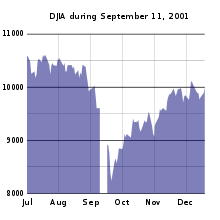 On May 6, 2010, the index lost around 400 points over the day, then just after 2:30 pm EDT, it lost about 600 points in just a few minutes, and gained the last amount back about as quickly. The intra-day change at the lowest point was 998.50 points, representing an intra-day loss of 9.2%. The event, during which the Dow bottomed out at 9,869 before recovering to end with a 3.2% daily loss at 10,520.32, became known as the 2010 Flash Crash. The index closed the half-year at 9,774.02 for a loss of 7.7%. On May 3, 2013, the Dow surpassed the 15,000 mark for the first time before towering above the next few millenary milestones thanks to commendable economic reports. The index closed 2014 at 17,823.07 for a gain of 71% for the five years before progress became minimal the next year. However, the overwhelming economic factors exhibited in 2015 precipitated the Dow's major pullback, which questioned some as to whether this was just a correction for the first time since 2011 or a fresh, new bear market. This led to the Dow closing at 17,425.03 for 2015, the first annual loss since 2008. After nearly 14 months since the last record close, the Dow finally achieved a fresh new, central-bank debt fueled record close on July 20, 2016 at 18,595.03 along with an intraday high of 18,622.01. During the late part of the 2010s, despite anticipations of post-election selloffs, the Dow rallied significantly after Donald Trump was elected President. On January 25, 2017, the Dow hit a record high of 20,000, an increase of 1,667 points since his election in November 2016. Throughout the course of the rest of 2017 and January 2018, the Dow skyrocketed past a few millenary milestones, including the symbolic 25,000 on January 4, 2018. However, on February 2, 2018, the Dow suffered its biggest loss since Brexit on June 24, 2016. As volatility made its return for next week, the largest intraday point drop of 1,597.08 points and largest closing point drop of 1,175.21 points were both set on February 5, 2018 although percentage changes were not as extreme as some past stock market crashes. Spring and summer brought much-needed relief for the Dow as the index eventually soared to new highs. By "fall", the Dow began falling tremendously again for two major reasons: fear of sudden spikes in interest rates by the Federal Reserve and woes in technology stocks. While the Dow plunged more than 10%, but less than 20%, on a closing-basis in late 2018 to confirm correction status, but not bear market status, the index rallied more than 10% from its Christmas Eve low, leading some to argue whether that correction has ended or needs to close at a new high. Investing in the DJIA is made widely accessible in equities through exchange-traded funds (ETFs) as well as in derivatives through option contracts and futures contracts. Several ETFs follow the Dow Jones Industrial Average, including with short or leverage strategies. The biggest has assets under management in the tens of billions dollars as of 2017. Due to the advent of pre-market trading, the ETFs provide a very accurate opening value for the average. In the derivatives market, the CME Group through its subsidiaries the Chicago Mercantile Exchange (CME) and the Chicago Board of Trade (CBOT), issues Futures Contracts; the E-mini Dow ($5) Futures (YM), which track the average and trade on their exchange floors respectively. Trading is typically carried out in an Open Outcry auction, or over an electronic network such as CME's Globex platform. Dow Futures is one of the most important premarket tool and reflect the mood in which DJIA will open. The Chicago Board Options Exchange (CBOE) issues Options Contracts on the Dow through the root symbol DJX in combination with long-term expiration options called DJX LEAPS. There are also options on the various ETFs; Performance ETFs, Inverse Performance ETFs, 2x Performance ETFs, Inverse 2x Performance ETFs, 3x Performance ETFs, and Inverse 3x Performance ETFs. The Dow Divisor was 0.14748071991788 on June 26, 2018. Presently, every $1 change in price in a particular stock within the average equates to a 6.781 (or 1 ÷ 0.14748071991788) point movement. With the current inclusion of only 30 stocks, critics such as Ric Edelman argue that the DJIA is not a very accurate representation of overall market performance. Still, it is the most cited and most widely recognized of the stock market indices. Additionally, the DJIA is criticized for being a price-weighted average, which gives higher-priced stocks more influence over the average than their lower-priced counterparts, but takes no account of the relative industry size or market capitalization of the components. For example, a $1 increase in a lower-priced stock can be negated by a $1 decrease in a much higher-priced stock, even though the lower-priced stock experienced a larger percentage change. In addition, a $1 move in the smallest component of the DJIA has the same effect as a $1 move in the largest component of the average. For example, during September–October 2008, former component AIG's reverse split-adjusted stock price collapsed from $22.76 on September 8 to $1.35 on October 27; contributing to a roughly 3,000-point drop in the index. As of March 2019, Boeing and UnitedHealth Group are among the highest priced stocks in the average and therefore have the greatest influence on it. Alternately, Pfizer and Coca-Cola are among the lowest priced stocks in the average and have the least amount of sway in the price movement. Critics of the DJIA and most securities professionals recommend the float-adjusted market-value weighted S&P 500 or the Wilshire 5000, the latter of which includes all U.S. equity securities, as better indicators of the U.S. stock market. A study between the correlation of components of the Dow Jones Industrial Average compared with the movement of the index finds that the correlation is higher in a time period where the average recedes and goes down. The correlation is lowest in a time when the average is flat or rises a modest amount. ^ Dow Record Book Adds Another First. Philly.com. Retrieved July 8, 2013. ^ a b "Dow Jones Industrial Average Fact Sheet" (PDF). Retrieved February 6, 2018. ^ O'Sullivan, Arthur; Sheffrin, Steven M. (2003). Economics: Principles in Action. Upper Saddle River, New Jersey 07458: Pearson Prentice Hall. p. 290. ISBN 0-13-063085-3. ^ Gritta, Richard; Adams, Brian. "Problems with the Dow Jones Industrial Average-A Simple Unweighted Arithmetic Mean: An Issue Re-Revisited". Global Review of Accounting and Finance. 7 (2): 68–79. doi:10.21102/graf.2016.09.72.06. ^ "Why the Dow Doesn't Work - McLean Asset Management". McLean Asset Management. April 23, 2015. Retrieved February 9, 2018. ^ "Wayback Machine" (PDF). May 28, 2008. Retrieved February 6, 2018. ^ "Dow Jones to change the composition of the Dow Jones Industrial Average" (Press release). Dow Jones. February 11, 2008. Retrieved February 11, 2008. ^ Browning, E.S. (June 1, 2009). "Travelers, Cisco Replace Citi, GM in Dow". The Wall Street Journal. Dow Jones & Company. Retrieved June 2, 2009. ^ Barr, Collin (September 10, 2013). "Alcoa, H-P and Bank of America to Be Dropped from the Dow Jones". The Wall Street Journal. Retrieved September 10, 2013. ^ "Why Alcoa, Hewlett-Packard Should Still Be in the Dow Industrial 30". TheStreet. ^ Shell, Adam (March 6, 2015). "iDow: Apple added to iconic Dow stock index". USA Today. Retrieved March 6, 2015. ^ Kaskey, Jack (April 2, 2019). "Dow Inc. Jumps in Trading Debut After Split From DowDuPont". Bloomberg. ^ "Fool.com: History of the Dow". fool.com. Archived from the original on October 4, 2013. ^ Dow Jones Indexes Website. Dow Jones Indexes. Retrieved June 19, 2018. ^ What happened to the original 12 companies in the DJIA?. Dow Jones Indexes. Retrieved March 14, 2010. ^ "LyondellBasell to emerge from Chapter 11 at end of month" Archived May 8, 2013, at the Wayback Machine. MarketWatch. Retrieved March 14, 2010. ^ "Setting the Record Straight on the Dow Drop", The New York Times, Retrieved March 22, 2010. ^ Dow Jones Closing Prices 1911 to 1920 Archived October 5, 2013, at the Wayback Machine. Automationinformation.com. Retrieved on August 16, 2013. ^ Anderson, Benjamin (1949). Economics and the Public Welfare: A Financial and Economic History of the United States, 1914–1946. LibertyPress (2nd ed., 1979). p. 219. ISBN 0-913966-69-X. ^ Dow Jones Closing Prices 1921 to 1930 Archived October 5, 2013, at the Wayback Machine. Automationinformation.com. Retrieved on August 16, 2013. ^ Dow Jones Closing Prices 1931 to 1940 Archived October 4, 2013, at the Wayback Machine. Automationinformation.com. Retrieved on August 16, 2013. ^ Buffett, Warren (February 2008). "Letter to Shareholders" (PDF). Berkshire Hathaway. Retrieved March 4, 2008. ^ Dow Jones Industrial Average Historical Prices. Yahoo Finance. Retrieved March 14, 2010. ^ McHugh, Robert D. (July 1, 2007). July 26, 2007…Black Thursday? Archived September 1, 2007, at the Wayback Machine. Gold Eagle Financial News. Retrieved February 14, 2010. ^ Murchie, Kay (August 17, 2007). Black Thursday on Stock Market. FinanceMarkets.co.uk. Retrieved February 14, 2010. ^ Dow Jones Industrial Average Historical Prices. Google Finance. Retrieved March 14, 2010. ^ The Dow Jones Has Never Been Higher. Slate. Retrieved March 10, 2013. ^ Paradis, Tim (May 6, 2010). Wall St. rollercoaster: Stocks fall nearly 10 pct Archived May 9, 2010, at the Wayback Machine. Associated Press. Retrieved May 7, 2010. ^ Gibson, Kate (May 3, 2013). U.S. stock rally lifts S&P 500, Dow to milestones. CBS Marketwatch. Retrieved May 3, 2013. ^ Dow Jones industrial average trades above 17,000 for first time after strong US jobs report Archived April 11, 2016, at the Wayback Machine. Associated Press. Retrieved July 3, 2014. ^ DJIA Trades Above 18,000 for First Time. The Wall Street Journal. Retrieved December 23, 2014. ^ "Dow Jones Industrial Average Closes 2014 Below 18,000 Milestone, But Gains 7.52% For The Year". International Business Times. December 31, 2014. Retrieved January 25, 2017. ^ Cramer, Jim. "Cramer: We're in a bear market". Yahoo. CNBC. Archived from the original on October 1, 2015. Retrieved 28 September 2015. ^ "Dow, S&P Close Lower to End Worst Year Since 2008". Yahoo! Finance. CNBC Videos. Retrieved January 2, 2016. ^ "Dow closes up triple digits at record, first 5-day win streak since March". Yahoo! Finance. CNBC Videos. Retrieved July 14, 2016. ^ Egan, Matt (January 25, 2017). "Boom: Dow hits 20,000 for first time ever". CNNMoney. Retrieved January 25, 2017. ^ Isidore, Chris. "Dow 25,000: A milestone 120 years in the making". Retrieved February 6, 2018. ^ Egan, Matt. "Dow plunges 666 points -- worst day since Brexit". CNNMoney. Retrieved February 3, 2018. ^ Imbert, Fred (February 5, 2018). "Dow plunges 1,175 points in wild trading session, S&P 500 goes negative for 2018". Retrieved February 6, 2018. ^ Business, Matt Egan, CNN. "Morgan Stanley: We are in a bear market". CNN. Retrieved November 20, 2018. ^ Daily, Investor's Business (November 19, 2018). "Dow Today Plunges; Leading Stocks In Bear Market | Investor's Business Daily". Investor's Business Daily. Retrieved November 20, 2018. ^ Johnston, Kevin (January 13, 2017). "Top 4 ETFs to Track the Dow in 2018". Investopedia. Retrieved February 9, 2018. ^ "Barrons Data Center Table". Retrieved June 26, 2018. ^ Edelman, Ric (December 23, 2003). The Truth About Money 3rd Edition. Harper Paperbacks. p. 126. ISBN 978-0-06-056658-6. ^ How Dow Jones Wrecked The Dow Jones Industrial Average. Business Insider. Retrieved March 14, 2010. ^ La Monica, Paul (September 15, 2008). Toss AIG from the Dow!. CNN. Retrieved September 21, 2010. ^ "Index Component Weights of Stocks in the Dow Jones Industrial Average". Index Insight and Market Timing Tools: Futures, Equities, Options. Ergo Inc. Retrieved July 25, 2014. Stillman, Richard (1986). Dow Jones Industrial Average: History and Role in an Investment Strategy. Dow Jones-Irwin. Goodrick, D. Scott (2008). Making Dollar$ and Sense on Wall Street. CreateSpace. ISBN 978-1438229010. 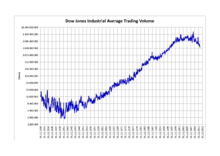 Wikimedia Commons has media related to Dow Jones Industrial Average.